The last post in this series was all about us finding out we were pregnant so I’m continuing that for this week. I found the first 12 weeks of pregnancy quite nerve wrecking. I didn’t have proper morning sickness but I felt queasy and dizzy and couldn’t eat a lot of food. So much was going through my mind and I was constantly thinking of different things. Our little baby had been given the endearing name of ‘squatter.’ I think it was my husband who first said it and then it just stuck and it was our little squatter all the way through the pregnancy. The 12 week scan booked in for early Feburary and that was when it started to feel real and exciting. I couldn’t wait to see our little baby on the screen and I was counting down the days. The weekend before I was due to go in for the scan I had a bleed; it wasn’t a bad one but I was upset. I phoned my Mum who told me to just get myself down to the walk-in centre to be checked out. Everything seemed fine and after a couple of hours in the waiting room things were starting to return to normal anyway. The Doctor was very good with me and he could obviously see we were concerned; he asked me what my main worry was and I said that I would lose the baby. He assured me that there were no signs of that happening and everything seemed normal but to put my mind at rest they brought forward the date of my scan to the Monday. I was so relieved everything was okay and even more excited that we would get to see our squatter earlier! James has managed to get the time off work so we set off to the hospital together, ready for that first scan. We negotiated our way around the corridors and sat nervously in the waiting area. As we waited another young couple came back into the waiting room to show her mum their scan picture. I almost started crying right there! They were so happy and couldn’t stop grinning at each other, too much for my over-active hormones! We were called into the little room and met the lovely sonographer, she explained what they would be quiet while they checked everything then we could see the screen. That was the worst part, I was holding my breath waiting for her to turn the screen around and when she finally did I was so relieved. Seeing our squatter for the first time just made us both smile, our baby was there, safe and well. We were the ones coming out with our scan photo and grinning like idiots. There was so much possibility in that little picture and we started to imagine our life with a baby. They had put my dates back from the scan and the due date was now 25th August 2011. 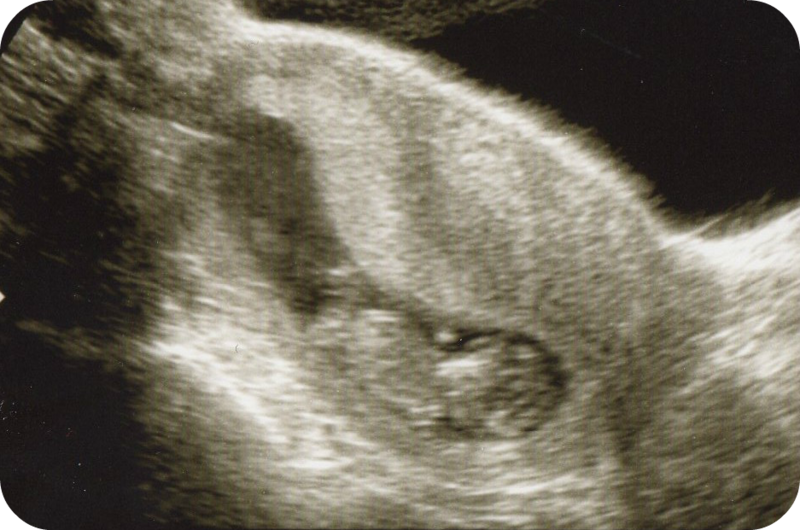 It seemed an eternity until that time; we were already both eagerly awaiting the next scan when we would find out if our little squatter was a boy or a girl. I forgot you used to call Lucas The Squatter! I didnt look at the scan image too long :o) But what a lovely moment it must have been seeing him for the first time & being told that everything was OK.
Haha, you might want to steer clear of the rest of the Flashback Friday posts as we come up to the birth! It’s lovely remembering it all. The first scan puts your mind at rest a little doesn’t it, knowing there is actually a little baby growing in there and seeing it makes it ‘real’.